AdAge reports that GM has moved approximately 25% of its total media budget online over the past three years. That’s 25% of a $2 billion+ annual media spend. 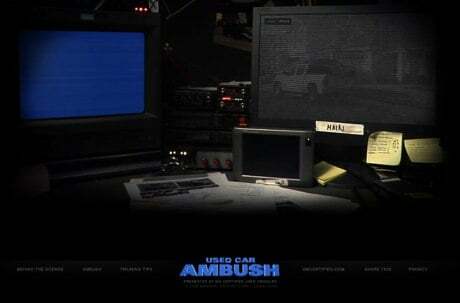 A current focus for GM’s online initiatives is the new Used Car Ambush program, a microsite and online campaign intended to convince used car shoppers to purchase certified GM used vehicles, rather than those sold by private parties. The site is perhaps a bit too polished to pull off its desired “organic” vibe, and it requires a serious download commitment from the user. But, this type of online-only content and accompanying campaign demonstrates that car makers are trying to use the Web to make their overall media spend more efficient in these tough economic times. Furthermore, reaching out to prospective buyers online enables automakers to presumably collect data from Web site visitors, allowing for ongoing, targeted follow up via email, postal mail, etc. This makes zero sense to me. First, if 66% of the country IS using the Web to research new vehicle purchases, that’s a colossal market segment. Second, I very much doubt that the other 34% are instead using television to research vehicles. How would that work exactly? You watch “24” hoping commercials for cars you like appear at the breaks? Comparing Internet and TV as opportunities for consumer pre-purchase research is like comparing apples and chihuahuas. Let’s don’t go crazy, however. There’s no question whatsoever that online advertising doesn’t have the reach or power to go it alone for a broad category like automotive. You need TV to generate initial interest and awareness (unless it’s just an under the radar program like Used Car Ambush). Once that awareness takes root via broadcast, the online components of the campaign pick up steam in a hurry. I’ve seen this happen many times, and it’s an easy phenomenon to measure (and agencies should try it). Measure search volume for your key terms. Then run a broadcast campaign (alone) for a couple of weeks. Then remeasure your search volume. You’ll find it goes up considerably. The same thing happens with banner ad campaigns. Click through rate always goes up after the market has been “softened” by broadcast. Automakers looking to market more efficiently should reduce their TV spend and use it in short bursts at the beginning of campaigns to introduce new models and programs, and then follow up with aggressive Internet advertising programs that are much more targeted and cost effective. Do you agree? Leave a comment.